As a sport requiring stability, focus and calm, curling seems to be suited for a more mature crowd. But in China, it's a group of youngsters who have their eyes set on the 2010 Olympics. At the 2007 Pacific Curling Championships, which concluded last week in Beijing, both China's women's and men's teams took home gold medals and have qualified for the 2008 World Championships in Vernon, Canada next March. It is the fourth time the women's team has qualified for the worlds, but only the first time for the men's. The Chinese men met Australia in the final and notched their first-ever victory over their archrival, stamping their tickets to the worlds. "They played very well this time, and the results reflect their normal training level," said Li Dongyan, the head official of China's curling team. "We have learned much from the previous failures against the Australian team and we finally made it a victory." The sport, in which players slide heavily polished granite stones across ice towards the target - known as the "house" - originated in 16th-century Scotland. 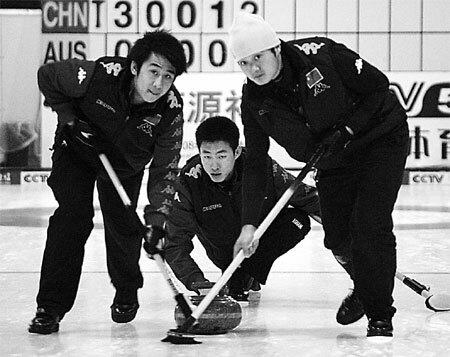 It did not come to China until 1995, when a group of curling experts from Japan and Canada provided training and equipment. In a sport where experience is as important as anything, some of the best curlers around the world tend to be some of the eldest. At last year's Turin Winter Olympics, for example, Scott Baird of the US men's curling team became the oldest Winter Olympian in history, aged 54 years and 282 days. In Canada, a country which typically dominates the sport, the average age of curlers is 39.9 years. But in China, where the sport is still trying to find a niche, all hopes rest on a group of athletes no older than 26. Their youth, some say, puts them at a disadvantage. "When you are younger, you have the physical advantage for sure. It's just training their mind to believe in themselves," said Daniel Rafael, the Canadian coach of the Chinese national curling team. "When I first met them in September, I noticed that they were working as four individuals that are supposed to be a team. So, it was just to get them working together." Rafael, who has been involved in curling for 38 years, was impressed with the talented Chinese players after working with the team for only a month. He said he is developing strong minds in his players, trying to get them ready to compete. "When I first met the Chinese teams in Canada, I saw the two teams were very, very talented. So I didn't think I was there to teach them how to curl - they already knew how to curl," he said. "What I was going to teach them is how to compete. That is very important. They just lack the confidence that a curling team should have." "Curling is such a psychological game, a mental game, they just had to have somebody to give them the confidence to play, to tell them, 'Look, you are good'," the coach went on. "So I basically tell them how to compete. I basically work with the mental part of their game, because the physical part, they just have nothing to do." The Chinese national team was formed in 2000, but there are still only about 100 curling players in the country and most of them are young. The average age of the women's national team is 22.8 and for the men it is 23.4. Li said a lack of venues made it impractical to recruit older players. "At present, we only have one professional venue for curling throughout the country. But next year we may have two more in Harbin and one more in Shanghai, but they will be smaller," Li said. "The promotion of curling depends a lot on the venue, so if there are not enough venues, it is hard to get more people involved. All the people on the national team are among the first group of people that learned curling in China." Despite these challenges, the Chinese teams, which were sent to train in Canada for several months a year, have made encouraging progress in recent years. At the 2005 Women's Curling World Championships, the Chinese team finished seventh in its debut. At the 12-team event last year they moved up to fifth. "We hope to achieve better results for the women's team, and for the men's side we expect them to finish in the top 10 in their worlds debut," Li said. The 2008 World Curling Championships will also be a point-collection event to qualify for the 2010 Vancouver Winter Olympic Games. "We will strive for more points to be qualified for the Olympics. The women's team has a big chance," Li added.